The girls all got up early Wednesday to help decorate for Jake’s Birthday. Since we couldn’t do something where he was sleeping, we decorated part of the common area including a special chair for him. Our decorations included the typical streamers, balloons, etc. as well as some coconuts for Jamaican flair. At breakfast we sang to him again and then, with the help of some of our Jamaican friends, proceeded to dump flour all over him as is the tradition in Jamaica. He was surprised for sure… and a good sport about it all. He took it well and we all had a good laugh to start the day. Jamaica Birthday Tradition – Flouring! We may have rubbed it in, but at least we didn’t follow with water like many Jamaicans wanted to do. After breakfast we headed out for our final day of VBS at Fullersfield Baptist Church. It was a great but chaotic day. A highlight for me was seeing some of the older kids actually somewhat engaged in the story times and other activities. I also loved seeing our team members step up and step out of their comfort zones time and time again, doing whatever they can to communicate Jesus’ love to the VBS kids. The end of VBS was challenging for us, especially as one of the women from the church forced the kids to leave right away afterward which made our goodbyes with them sudden and short. A little one waiting for mom at the health screenings. Some girls hanging out at the health clinic after VBS. After lunch, the health clinic team set up while the rest got changed to head back to the construction site. We had a few VBS moms and a few others at the health clinic but due to it being Jamaica’s Independence Day numbers were down. I personally used the time time clen up from VBS and get the supplies we brought organized to leave at the church. We tried the mobile clinic again by taking a long route to the construction site, but again, Andy guessed most people headed to the beach for the holiday. When we arrived at the construction site, our team was hard at work with the Jamaican workers. I loved seeing the buckets passed … American… Jamaican… American… Jamaican… truly working together… and laughing the whole time. We came to serve… and found ourselves BEING served! 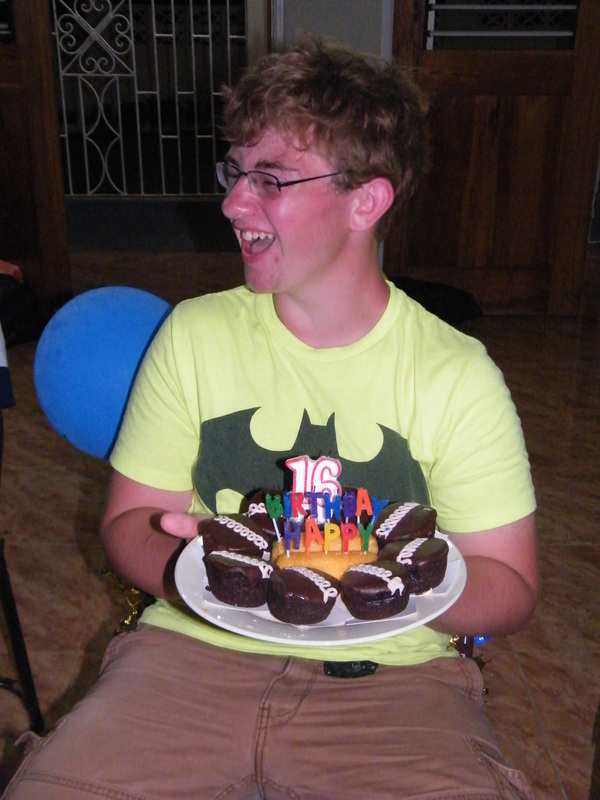 During our group devotion time, we sang one last time to Jake with his “cake” made out of Hostess cupcakes and twinkies c/o his mom, complete with candles that wouldn’t stay lit no matter what I tried due to the large quantity of fans we had going in the room to keep it cool. It was so awesome to see him willingly and joyfully give up his birthday to serve others in Jesus’ name!